Redemptions – Believe it or not, we’ve used American Airlines to get us to our Caribbean destination of choice on miles each and every year. Being from New York, there’s always either a direct flight from JFK or a connection via Miami. This year we secured our seats on LGA-MIA-CUR-MIA-JFK flights in economy for 35,000 AAdvantage miles per person. 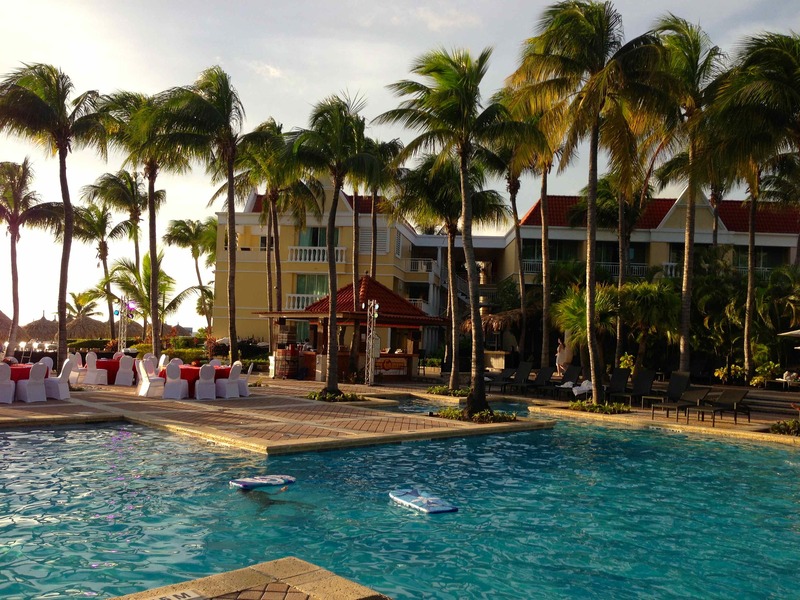 For the hotel, our choices were the Hilton Curacao or the Curacao Marriott Beach Resort. After reading tons of traveler reviews, we decided on the Marriott which was more recently renovated and seemed to have a nicer beach and pool. I had enough points for one room at the standard category 6 rate and the rest of my family signed up for the Chase Marriott Rewards Premier card to cover the other room. The rooms were 30,000 points per night but we got our 5th night free, making the rooms 24,000 Marriott Rewards points per night. We also stayed a 6th night and paid an additional 30,000 points for that night. I should mention that the hotel only had the standard room rate available on random days throughout Christmas week. I took a shot in the wind and booked all the available standard reward nights and then called in-house reservations and asked if they could book the missing dates. I was told that it was Christmas week so it would be difficult, but it was not a flat out rejection as the rooms were still available for sale. They told me they had a Marriott Rewards waiting list and would email me if any standard rooms opened up. Sure enough, not even a week later they emailed me to inform me that both rooms were now booked for all six nights at the standard rates. The rooms available at the lowest level were resort view rooms. The Flights – Traveling during holiday time we’ve had our share of “interesting” flight crews, however this year everyone was actually really merry. Upon boarding at LGA we were greeted by a flight attendant with reindeer ears and later passed another in a Santa hat. In fact, all the flight attendants had some sort of holiday flair incorporated with their uniforms. The trend continued on our MIA-CUR leg as well. The flight itself on the 757 was uneventful with standard service. Using my AAdvantage lifetime elite Gold status I reserved exit row Main Cabin Extra seats for the entire family. The flight attendants came around shortly after takeoff for drink and buy-on-board service and then we didn’t really see them for the remainder of the flight…unless we headed to the back galley to use the bathrooms. That’s fine, we expected as much and brought our own breakfast on board. I also requested a full can of club soda and a water so that I’d be set for the flight. There was an overhead movie being played on both flights, though I opted to catch up on a few TV shows that were downloaded on my laptop (the MacBook Air can last for the full 5 hours but our row had the standard outlets as well). We ended up landing early in both Miami and Curacao. The Hotel -At the time of the trip, I had no paid Marriott stays in 2012 and was only a silver elite. Luckily, The Weekly Flyer reminded me that Marriott was running their platinum challenge with an immediate platinum status match. I called from the airport in Miami and was told the update would reflect the next day. However, the customer service agent also placed me on hold while she called the hotel to inform them of our updated status. She came back to tell me that the hotel had already upgraded us to partial ocean-view rooms. Upon arrival at the hotel, check-in was fast and our rooms were ready even though it was prior to the official 3pm check-in time. For our platinum amenity we were allowed to choose two of the following or 500 points: a bottle of wine, cheese & cracker platter, fruit platter, or Haagen-Dazs ice cream (vanilla, chocolate, cookies & cream). Additionally, we were also given a password for free wifi for the entirety of our stay (the only real benefit of Platinum status at this resort). The Beach – Before arriving, we had concerns that the beach was rocky and that it would be difficult to actually get into the water. While the areas to the extreme left and right of the hotel did have quite a number of rocks, it was easy to enter the water most everywhere else. There were a few small shells and rocks but they are smooth from the constant tide. We didn’t have any problems getting in and enjoying the water, though we definitely avoided entering at the hotel’s extremes. There’s also a volleyball court, a beach bar, and ample chaise lounges. Unlike most of the other resorts we’ve been to during Xmas week, you did not need to get up at 6am to reserve chairs. An umbrella is a different story though and my mom was up bright and early to secure one. You can easily walk from the Marriott to the Hilton along the beach and you’ll see why we choose the Marriott. The Hilton has nice views above the beach, but besides a staircase leading almost directly into the water, you’ll be watching the water from the concrete overlook. As nice as the Marriott beach was, we spent most of our days exploring the beaches all over the island. See the bottom of this post for our favorite locations. The pool area was the most recently renovated and it showed. There are great views of the ocean from the pool and you can even order food and drinks at the swim-up bar. It too was crowded, though we never had any problems with chairs. Food – Being a platinum member did not include complimentary breakfast, leaving us with the choice of an overpriced hotel breakfast or a few quick (and less expensive) options at the on-site deli. We went with the deli option each morning, stopping on our way out to the rental car. The deli had apples, bananas, muffins, croissants, yogurt parfaits, egg sandwiches, fruit cups, and cereals. There was also coffee, tea, juices, and waters for purchase as well. Tip – if you are heading to a beach without any facilities, pick up some sandwiches and large waters (and maybe some beers) so that you’ll be set for the day (they have ice and coolers too). Nightlife – There isn’t much of it! The hotel has a casino but on the night we went inside to take a look, there were at most five people there. There’s also a lounge but it too has a small crowd. We expect as much in the Caribbean (when not in Aruba or Puerto Rico) and so we made our dinner reservations for 830pm each night. Feel free to email me for a list of our favorite Curacao restaurants. We had some excellent meals and several of them had incredible views as well. Which brings me to the only problem we had with the hotel, there was a problem with our confirmed dinner reservations EVERY single night. I normally email the hotel about a month in advance with a list of restaurants and requested dinner times. The concierge then checks what times are available and sends back an email of confirmed times and locations. This year, the concierge somehow got the time wrong three of the nights, compeltly got the date wrong on another, and swapped dinner locations on the two other nights. Luckily we were in Curacao and everyone at the restaurants was extremely accommodating and happy to help. You’ll also want to watch out for the forced special Christmas menus on Xmas Eve, Xmas, Boxing Day, and the day after Boxing Day! 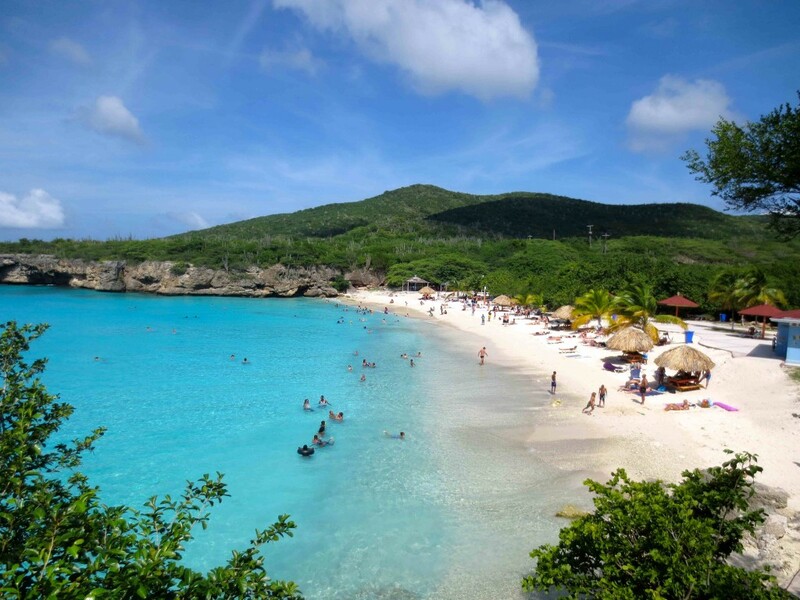 Our Favorite Off-Property Beaches – Forget about your rocky beach concerns,we experienced some of our favorite and most picturesque Caribbean beaches in Curacao. Sure there are rocks and coral as you enter, but the water and scenery is incredible (it’s also easy to find a path that’s rock free). Additionally, the coral makes for some great snorkeling right off the beaches. All of these beaches had great sand and calm warm water. We used a rental car (use the Enterprise agency at the Marriott which is cheaper than the Budget at the Hilton and book in advance if possible) to get to Groot Knip Baai, Playa Kenepa Grandi, Playa Cas Abou – Bon-Bini Beach, and Playa PortoMari. Driving was easy and Google Maps did a great job with navigation. Overall, we had another great and relaxing family trip and our only real costs were food/drinks and a rental car (thanks to our AA miles and Marriott points). The people on the island were extremely friendly and the beaches were beautiful. I’d recommend a trip down to Curacao if you haven’t visited, though you’ll need to use AA/BA miles or points from an American redemption partner if you plan to fly from the US (unless you want to connect in BOG or CCS). Using UA/US miles, Air Canada operates a flight from Toronto. Additionally, if flying from Europe, KLM has a direct flight from Amsterdam. Annual Airline Quality Rankings Out – UA Tops Complaints, AA Worst for On-Time Flights…Who Actually Did Well? I had no idea the beaches were so gorgeous in Curacao. Thanks for sharing Adam, definitely on our radar for our next caribbean trip. @Amy – Great, let me know if you need any advice. Your pictures of the pool at the Marriott look nicer than their website. We might head down there for a quick spring weekend trip. @Todd G – The pool was really nice and there’s a nice poolside BBQ, smoothie stand, and bar. Beautiful! How was the snorkeling?? 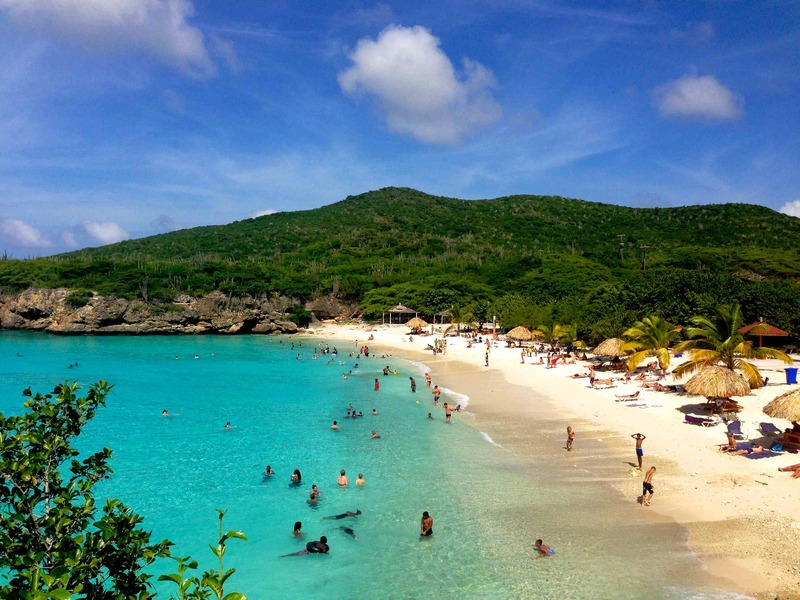 Curacao has been on our potential list for some time now. @Don PDX – The snorkeling was great, several spots that were an easy swim from the shore at each of the beaches we visited. Much more active life than other islands I’ve visited. You’ld pick this over Aruba? What’s your favorite island in the caribbean! @DrNo – That’s a tough one, they are very different experiences. The hotels along Palm Beach in Aruba are gorgeous (especially the Hyatt…also a Radisson, Westin, and Holiday Inn Sunspree), but the island itself is much more built up and there are lots of tourists. Flights are offered from almost every major carrier as well as JetBlue. That being said, there are more activities, nightlife, casinos, dining options, etc. There were days in Curacao on the other hand when it was just us and locals on the beach. It’s really more about what you are looking for in terms of your perfect vacation. My favorite islands are Barbados and St. John. I’d choose the beaches in Grand Cayman over Curacao any day. I thought the snorkeling was better in the former than the latter, even the snorkeling from the beach behind the hotel. @Danny – Yea, I really liked our time in Grand Cayman as well and the snorkeling there was fantastic too (as was the diving). I guess Curacao was more about the surprise of just how nice and secluded the beaches were. Also, more than just the beach itself, the gorgeous vistas of the hillsides, pine, and cactus that were visible from the sand made the beaches even nicer. It looks like you had a blast, great you enjoyed it! Snorkling is definitely my favourite activity on that beach, just so much to see. Did you go to the Indonesian place for dinner, up the hill? We enjoyed our food there, that was in 2011, hopefully it is still there. Your pictures make me want to go back, and just relax on the beach for a week. We stayed at the Marriott as well. I agree the rooms are fine for what they are, sleeping. During the day you’re always going to be outside enjoying the island. The pool and beach at the Marriott were quite enjoyable for us and we are very happy we choose the Marriott over the Hilton as well. Why are Barbados and St John your favorite destinations? That’s awesome you got the status upgrade the same day of arrival! We were just in Curacao in late January. We had booked the Hyatt before it got rebranded and were still able to have our award reservation honored. The hotel (now called The Santa Barbara Resort) is out of town and so we had a rental car, which was nice since the island was worth exploring. Our favorite beach was in the north of the island, Playa Kalki- with the best snorkeling we found on the island. One of best meals was in the fort in Willemstad at the Renaissance Resort- definitely recommended. Great report! I enjoyed Curacao, and think it is an underrated island. I recently wrote a report as well, including a stay at the Marriott Resort as well as the Renaissance Resort. Did you think about staying at the other Marriott property in town? @corridorr! – we didn’t. It was cheaper and had plent of award rooms available but it’s a downtown city location. There is no beach. We visited one night and the Marriott was much nicer than the Renaissance in my opinion.